Beto ORourke is officially in the 2020 presidential race, but early polling suggests his Vanity Fair profile isnt going over well. ORourke, who announced to his supporters Thursday morning he was tossing his hat in the ring for the Democratic nomination, was the star of a fawning, 8,600-word opus published by the prestigious magazine on Wednesday. The wide-ranging interview is the cover story of the latest edition of the magazine, with the 46-year-old boldly declaring he was "just born to do this". 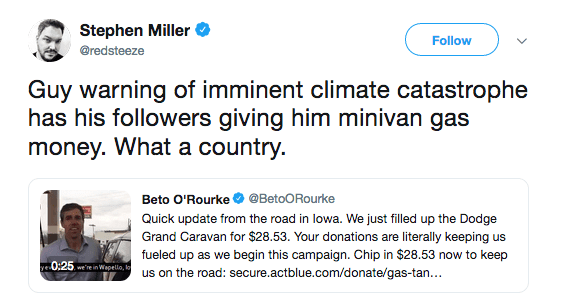 The Vanity Fair piece, written by Joe Hagan, seemed to echo the fawning tone of much of the media coverage that followed his failed bid to unseat Texas GOP Sen. Ted Cruz last fall. Hagan, who previously penned a similarly photographed and written profile of another Democrat, former presidential candidate John Edwards, wrote in the new piece: "For ORourke, what followed was a near-mystical experience," referring to his entry into politics. I for one preferred Al Gore’s package just before the election. with Hillary!’s famous photo cover? Twitchy has a thread about how this article is almost a spitting image of one the photographer and writer of this one did about John Edwards. Hagan obviously gets a stiffy writing about male Democrat candidates hair. I am positive that the photo of Betoooooo on the Vanity Fair cover is photoshopped. Just a bit ago, Fox showed the cover and then a separate different photo. There is no way his shoulders and chest were as defined. Smoke some more dope, Bozo. You know you want to. To who? Birds that crap on the torn-out pages? There needs to be a constitutional amendment that only former Governors, those who have served 4 years in the military, or CEOs of major corporations can only run for President. He’s running for the Dem nomination? Another privileged honky trying to take work from downtrodden women and minorities! Just say no to the white privilege, Democrats!! Dude, like don’t forget the skateboard. Like totally. 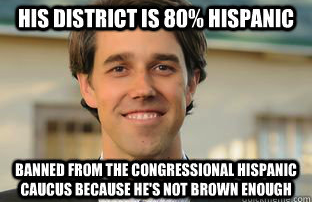 Please, let's all give Beto a break! An insulting event early in his political career scarred him for life. It's a wonder he can function at all. But does he dress right or left? Don’t tell me they left out that crucial information. He reminds me of Jonn Elway or John Kerry . Horseface . If you told me this guy was Kerry Jr, I’d totally believe it.